Dominion Macklem Mortgages has access to more than 60 lending institutions; this includes big banks, credit unions and trust companies. Our licensed team of mortgage professionals is familiar with many mortgage products – ranging from first-time home buyer programs, financing for the self-employed and financing for those with credit blemishes. The best part of working with Dominion Macklem Mortgages is that our mortgage professionals work for you – not the lenders – to ensure you receive the best rates and products available in today’s marketplace. Whether you’re looking to purchase your very first home, renew your existing mortgage, or refinance your mortgage to free up some equity, we have a variety of products available to meet your unique needs. 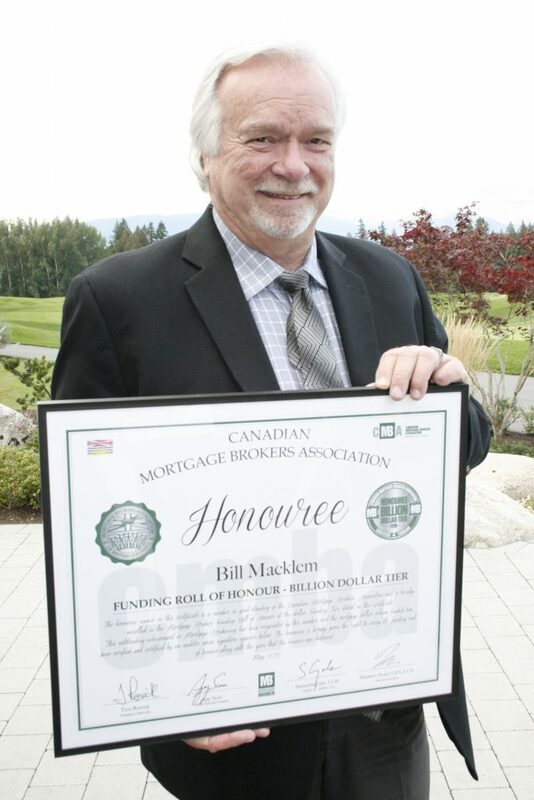 The Canadian Mortgage Brokers Association – British Columbia (CMBA-BC) is pleased to announce that Bill Macklem of Dominion Macklem Mortgages has been inducted into the MB Funding Roll of Honour at the $1 Billion Tier. READ ARTICLE. Bill Macklem has a passion for helping people with their money, whether it's for their personal or business financing. He founded Macklem Mortgages in 1987 with the goal of providing exceptional customer service that is not found at banks and credit unions. We are proud to say that we have been in the ‘Top 75 Mortgage Broker’ category in Canada for over 30 years. We have a team of professionals at our head office who are ready and able to assist you. You can reach us at 604-684-4663. Don’t hesitate to ask us something. Email us directly billm@macklemmortgages.com. Whether you prefer phone, in-person or online assistance, we’re always here to help. Dominion Macklem Mortgages is a locally owned and operated Mortgage Brokerage that works for the people of Vancouver and associated regions. Providing the best service and rates in the business, it’s no surprise we have been in the ‘Top 75 Mortgage Broker’ category in Canada for over 30 years.